Diopside based ceramics and glass-ceramics have potential applications in various technological areas. A diopside based glass-ceramic named 'silceram' was produced by scientists from Imperial College, UK during the 1980s from blast furnace slag and other waste products. The as produced glass-ceramic is a potential structural material. Similarly, diopside based ceramics and glass-ceramics have potential applications in the field of biomaterials, nuclear waste immobilization and sealing materials in solid oxide fuel cells. ↑ C. D. Gribble, ed. (1988). 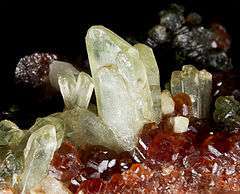 "The Silicate Minerals". Rutley's Elements of Mineralogy (27th ed.). London: Unwin Hyman Ltd. p. 378. ISBN 0-04-549011-2. ↑ M M Smedskjaer; M Jensen; Y-Z Yue (2008). "Theoretical calculation and measurement of the hardness of diopside". Journal of the American Ceramic Society. 91 (2): 514–518. doi:10.1111/j.1551-2916.2007.02166.x. ↑ A L Boettcher (1967). "The Rainy Creek alkaline-ultramafic igneous complex near Libby, Montana. I: Ultramafic rocks and fenite". Journal of Geology. 75: 536–553. doi:10.1086/627280. ↑ Eugenio Barrese; Elena Belluso; Francesco Abbona (1 February 1997). "On the transformation of synthetic diopside into chrysotile". European Journal of Mineralogy. 9 (1): 83–87. doi:10.1127/ejm/9/1/0083. ↑ "Asbestos in Your Home". United States Environmental Protection Agency. 2003. Archived from the original on October 8, 2006. Retrieved 2007-11-20. ↑ Hausel, W. Dan (2006). Geology and Geochemistry of the Leucite Hills Lamproitic field, Rocks Springs Uplift, Wyoming. laramie, Wyoming: Wyoming geological survey. ↑ Kalotay, Daphne (2010). Russian Winter (First ed.). New York, NY: Harper. pp. 184–185. ISBN 978-0-06-196216-5.